First cut a 6" x 9 1/2" piece of orange card stock and fold it in half for the base, a 4 1/2" x 5 3/4" piece of black for the middle layer, a 4 1/4" x 5 1/2" piece of white for the front layer, a 1 1/2" piece of patterned paper for the pumpkin strip, a 2" x 4" piece of patterned paper for the orange strip, and a 1 3/4" x 2 3/4" piece of white for the image background. Then on the front layer use a Stampin' Up! Gorgeous Grunge set to randomly stamp the circle and larger splatters in Stampin' Up! Tangelo Twist ink, the smaller dots with Stazon Jet Black ink then the smaller dots again with Stampin' Up! Basic Grey ink. Then attach the patterned paper strips to the front layer. 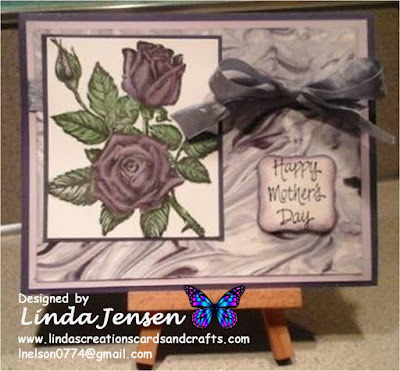 Next using a Gorgeous Grunge stamp randomly stamp the small dots on the image's background with Jet Black then Tangelo Twist inks and attach it to the front layer. 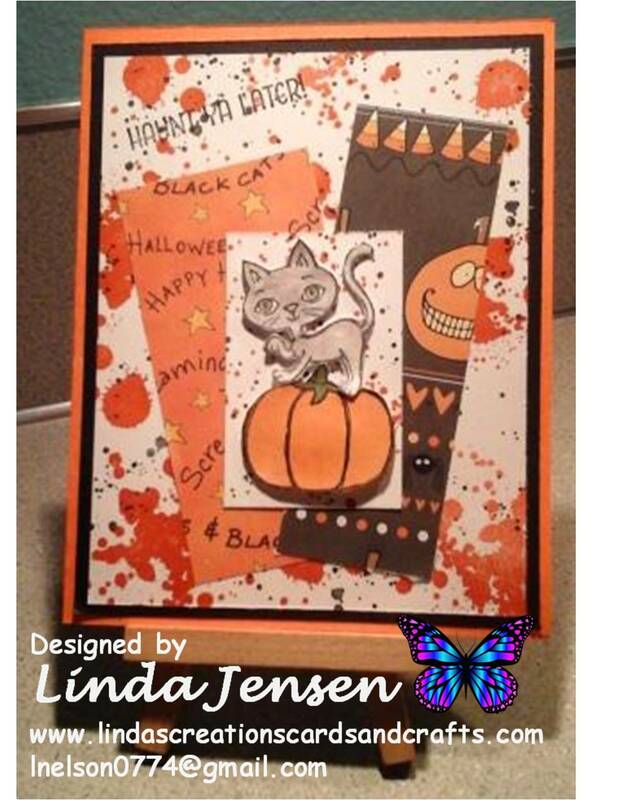 Then stamp the cat and pumpkin on a separate piece of white card stock in Jet Black ink. Next color the cat with Stampin' Up! Smoky Slate and Always Artichoke inks and the pumpkin with Tangelo Twist and Always Artichoke. 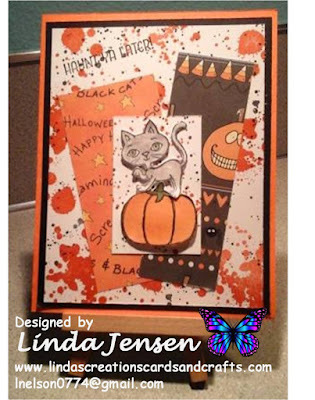 Then cut them out, attach the cat and pumpkin to their background with mini pop dots, stamp the sentiment in Jet Black ink, finish assembling the card and enjoy!